Next leg is Mag Bay to San Jose Del Cabo (23.02N x 109.38.5W), just around the corner from Cabo San Lucas. 176 miles. 114 gallons of fuel with very favorable currents. Scheduled to be 24 hours at 7.5 kts. Easy to schedule since you leave at the time you want to get there. We left Mag Bay at 8:30am planning on being at the mouth of the marina in San Jose Del Cabo when the marina office opened at 9 am the next day. 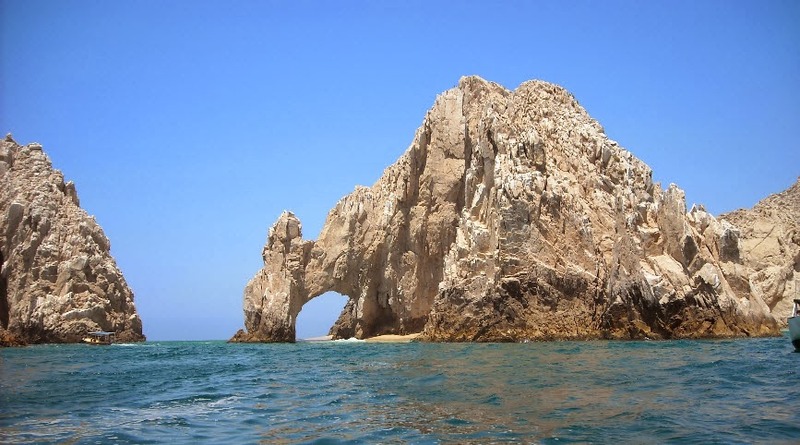 The guide book says there are “no suitable anchorages” between Mag Bay and Cabo San Lucas. A single roadstead is listed an emergency relief only stopover. We saw few lights on shore until we approached Cabo San Lucas. Weather forecast called for potential rain and thundershowers. A few boats left Mag Bay the night before but the official FUBAR forecast called for 2-4 ft seas with possible localized thunderstorms. The trip went very smoothly for us, weather held until we reached the turn to the west at Cabo San Lucas. Our radar showed a strong line of thunderstorms and rain just to our starboard side and south. Had the weather been 10 miles further north we would have had a much more exciting ride. Several of us were hoping for a rain shower to rinse off the salt accumulated from 600 miles of open ocean. Instead we got just enough rain to wet the decks and stir up any dust onboard. Between the salt and fish blood WORKNOT is in need of good bath. At least the crew is well groomed and clean. Rounding Cabo just at sun up was a real sight. A major cloud and rain formation was to our southwest and Land’s End to the northeast. From Wikipedia: El Arco de Cabo San Lucas, or Lands End, Cabo San Lucas is a distinctive rock formation at the southern tip of Cabo San Lucas, which is itself the extreme southern end of Mexico's Baja California Peninsula. Guide books report the arch has been cemented due to damage from the many cruise ships that visit the harbor. Vibration from the ships damaged the structure but the draw for tourists justified the repair. One side of the arch is known as Lovers beach and the other Divorce beach. My first trip to Cabo was in the late 1990’s to work on a boat belonging to Jack Whiteman’s surgeon. (I worked for EMPIRE at the time) Jack was the founder of EMPIRE and we had repowered the boat. It was a disaster and for any Cat folks, it involved a pair of 3176 marine engines. Not Cat’s best effort. Jack told me to stay until the boat was fixed. Before it was over we had repowered it again. The waterfront was a few restaurants, sport fishing operations and mom and pop hotels that only took cash. Today it’s hard to tell the waterfront from downtown LA or Las Vegas. Among the notable spots, a Ruth Chris, Harley Davidson store and more “American” icon places to spend your money. FUBAR did not stop at Cabo but continued around the corner to San Jose Del Cabo. A little more laid back than Cabo we found the resort marina of San Jose Del Cabo to be a true Oasis after traveling from Ensenada to there without a marina stop. Our crew, Dave (Mary’s brother) and Lori fell in love with San Jose and a peaceful mutiny ensued. Perhaps it was 800 miles of open ocean in 10 days, all within 50 feet of family or the true serenity of San Jose but we were happy to see them so enthused about Mexico and the area. Dave provided me a golf lesson on a stunning course that followed the coast line and Lori and Mary visited the many art studio locations in town. The marina hosted a cocktail party on the roof of a hotel overlooking the harbor. We too, could have stayed there for days just enjoying the hospitality and outstanding weather. Below is view of the landmark cross located at the base of the harbor. Next stop is scheduled to be La Paz, (24.13 N x 110.18 W) 122 miles from San Jose Del Cabo.